The annual Pride Parade made its way through Boston streets. 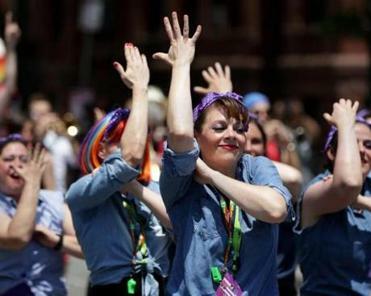 Draped in rainbows, 29 survivors of the Pulse nightclub shooting in Orlando danced among flags bearing the names of their fallen friends as their float was met with continuous applause all along the Boston Pride parade route Saturday. The survivors’ float, adorned with 49 flags honoring those who died in last year’s attack, wasn’t the first in the annual parade, but it was quite possibly the highlight. 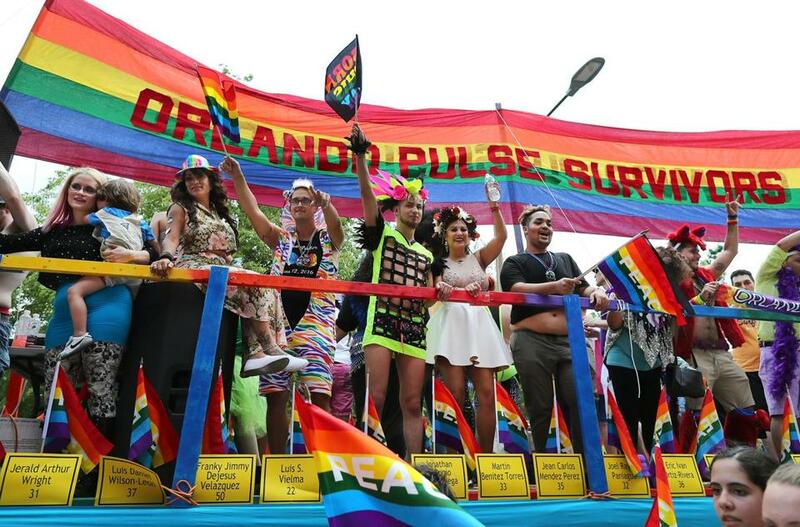 The Orlando contingent carried the event’s 60-foot Pride flag. The 2.27-mile parade kicked off the city’s 47th Pride celebration with a theme of “Stronger Together.” Thousands flooded the parade route and City Hall Plaza, where a festival and free concert stretched into the evening. Organizers and attendees alike said the day carried more weight this year. More than 300 organizations marched in the parade, according to organizers. Bruni said the organization was in close communication with the Boston Police Department about security and brought on more volunteers to be additional “eyes on the ground.” Police said no incidents had been reported as of early Saturday evening. Colby and Sarah Swettberg brought their 3-year-old son, Theo, out for what they called a family affair. The couple said they’ve been to every Boston Pride for the past 20 years. Colby Swettberg said it’s even more important, in the current political climate, to speak up. Pride festivities continued throughout the day, starting with a breakfast at the Solas Irish Pub hosted by Mayor Martin J. Walsh. “We’re marching with Marty because he believes in equality,” said Kerry O’Brien. O’Brien, who attended the breakfast with her 19-year-old daughter, Maggie, said she was marching for her brother who came to Massachusetts to marry his partner. The concert on City Hall Plaza following the march, headlined by Fantine, Carlito Olivero, and Lillie McCloud, featured 11 acts. Boston Pride will also hold a Stronger Together Rally in solidarity with the Global Equality March for Unity and Pride in Washington Sunday starting at 11 a.m. on the Boston Common. Ultimately, Pride is about coming together once a year for a special occasion, Frank LaPiana said Saturday morning. LaPiana marches in memory of his partner, he said, who died of AIDS in 1985. The 75-year-old has been at Pride every year for the past three decades. @globe.com. Follow her on Twitter at @saracsalinas.